Premises liability accidents can present a host of complicated legal issues. We have all likely experienced or witnessed a slip and fall at a store or else we know someone that has. 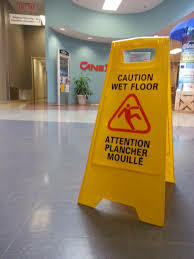 Everyone has gone shopping at one point in their lives and seen a sign which warns them of a wet floor or some other slipping hazard. Slip and fall accidents come within an area of law known as premises liability. Premises liability refers to the legal responsibility of the owner or person in control of a piece of property to maintain the property in a safe condition for lawful visitors. When an owner fails to uphold this duty and a visitor is injured, the owner can be legally responsible under a premises liability theory. Negligence is usually the main area of dispute in a Massachusetts premises liability case. An owner has a duty to ensure that a property is free and clear of any obvious injury hazards. The owner also has a legal duty to warn visitors on the premises of a hidden hazard that could also cause injuries. Not all slip and fall or trip and fall accidents bring liability for the premises owner. Owners cannot be expected to immediately clean up every spill that occurs in a grocery store for example. If a banana pill falls on the floor and a visitor slips on it less than a minute later, the law would not likely find the owner liable in a premises liability case. Also, if the hazard is so open and obvious that any reasonable person could be expected to avoid it easily, then the owner may also not be held responsible. Assuming that negligence can be established against the property owner, a Massachusetts premises liability case may then be brought. The owner will be responsible for the typical damages of any other personal injury case, including any medical bills and pain and suffering caused as a result of the accident on their premises. If you have been injured and you think you may have a claim for premises liability you should immediately consult with an experienced personal injury attorney. At the Law Offices of Jeffrey S. Glassman, we have experienced with premises liability accident cases. For a free consultation call us today at 617-367-2900.